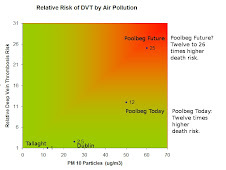 Did DCC Mislead The Oral Hearing (Poolbeg Incinerator)? CBRE's charts are highly misleading (as a professional researcher would know). - Peter Malone chairs property company, CBRE Gunne. CBRE Chairman Peter Malone ticks a few appropriate boxes. 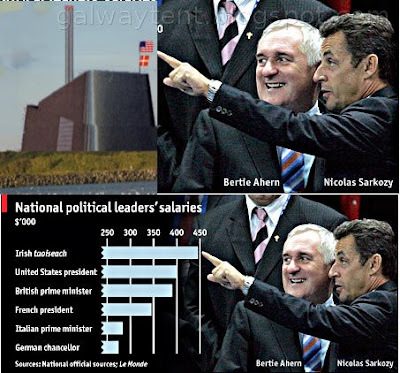 He is a well-known hotelier -- not an engineer -- and was the boss of Jurys; but Peter is also a favourite of politicians. Apart from being parachuted into the NRA chair by ministerial patronage, he has served as chairman of semi-state Bord na Mona, was a member of the review body on higher public sector remuneration and chairs property company, CBRE Gunne. 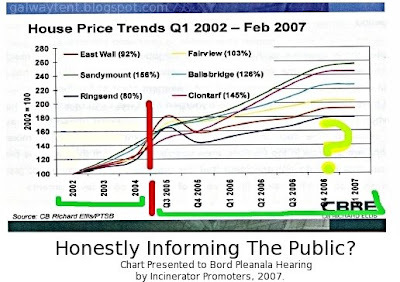 What is interesting about CBRE Gunne is that they gave Fianna Fail generous donations in 2004 and 2005. The NRA annual report tells you none of this. 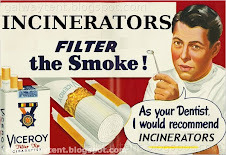 Phoenix Magazine comments challenge the credibility of the CBRE researcher - the professional who presented the property report under direction of the incinertor promoters.
" .. the players who peddled the property guff for so long - the banks, developers and estate agents - are in shock. At this point a special mention must go to the likes of Marie Hunt of CBRE ... "
The Phoenix Magazine, Annual 2008, page 138.
WHO will be the first victim? Someone will soon go to jail for not paying a €3 toll fee on the M50. Come back, National Toll Roads, all is forgiven. The smuggest AGM in Irish history will be held on Thursday. Tom Roche and Jim Barry of National Toll Roads will do a lap of honour in Dublin's Westbury Hotel. First, the duo wiped the State's eye by buying the West-Link. Next, they crucified the M50 motorists. Finally, the Government took them off the pitch in an expensive buyout. Yet within weeks, the buyer has turned a triumph into a shambles. What a lucky escape for the NTR monopoly. The flak they took for so long has been deflected onto the State. Did those of us who campaigned to dismantle the toll barriers win a hollow victory? The National Roads Authority (NRA) has taken over the West-Link. Goodwill was waiting in abundance. It has been obliterated at the stroke of a pen. The new M50 rip-off regime threatens to eclipse the excesses, even of NTR. Ireland's drivers are no longer being mocked by opportunist businessmen. Instead, they are being scorned by the State. I am thinking of heading to the AGM on Thursday. I still hold 100 shares in NTR, which I bought to cause maximum disruption for the guys fleecing motorists on the West-Link. I feel like apologising. NTR was a ruthless despot; but the State is worse. At least NTR has the good grace to hold an AGM. Three years ago, when I took the podium as a tiny shareholder, chairman Tom Roche -- with his hundreds of millions -- gave me a polite hearing. So our most promising route to halt the fresh farce at the West-Link should be the NRA AGM. A small catch: the NRA holds no AGM. It is government-owned. No room for democracy there. The NRA directors never come out to play. The crisis looming at the M50 toll bridge this weekend is a matter for them; but they are invisible and anonymous. The NRA board is, in theory, the choice of the Irish people. In reality, its composition would make Jo Stalin blush. It is stuffed with political appointees. Last week I decided to find out a bit about the NRA directors. Not an easy task. First, I turned to the NRA annual report. And there they were. Pictures of them all. Not a syllable of information on their education, jobs, expertise or their pedigrees. Not a whisper about their pay, which turned out to be €9,000 a year. So I rang the NRA to ask about the board. The first reaction was stunning. "We have no public record of their backgrounds." A press officer told me that it was a matter for the Department of Transport. For all the NRA knew or cared, its own directors could have escaped from Mountjoy Jail last week. Happily, a helpful NRA employee told me a bit about a few of them -- from memory. Chairman Peter Malone ticks a few appropriate boxes. He is a well-known hotelier -- not an engineer -- and was the boss of Jurys; but Peter is also a favourite of politicians. Apart from being parachuted into the NRA chair by ministerial patronage, he has served as chairman of semi-state Bord na Mona, was a member of the review body on higher public sector remuneration and chairs property company, CBRE Gunne. Nor does it tell you anything about Peter's fellow-director, Connie Ni Fhatharta. An interesting woman, Connie. Of most interest is that she is a Fianna Fail councillor in Galway and a defeated Seanad candidate. Nothing wrong with that. Just that we ought to know. Nor does it tell you anything about Jenny Kent. By all accounts, Mrs Kent is an able woman. She comes from a topical place; currently she is president of the Laois Chamber of Commerce. "Ahem," I hear you mutter. "Laois, eh? A protegee of Brian Cowen?" Not so. Jenny is her own woman. But a few inquiries revealed that Jenny's husband is an Irish Farmers Association bigwig , a disciple of Tom Parlon -- the former Progressive Democrat minister from the same Laois constituency. The PDs too are entitled to their share of the spoils. Nor does the annual report breathe a word about director Raymond Potterton. A little digging reveals that Potterton was a business partner of Loman Dempsey, brother of none other than cabinet minister Noel Dempsey. Take a look at board member David Holden. A former Bank of Ireland spinner, Mr Holden is well qualified to advise the NRA about how to impose hidden charges on the motorist. But there is more than hidden charges to Mr Holden. He was a great friend and supporter of the late Fianna Fail minister Seamus Brennan, who appointed him to the board. David even delivered a eulogy at Seamus's funeral. Plenty of political pedigree there. Not to mention NRA director and Thurles councillor Frances Boyle, whose father was a Fianna Failer and herself was regarded as a Progressive Democrat/government sympathiser -- although elected as an independent. Frances runs a shop in Thurles. Even NRA director Eimear McAuliffe, a nurse by profession, loyally flew the Fianna Fail flag as a candidate at the last local elections. These are the people presiding over the farce that is the M50 this weekend. Political appointees are propping up a monstrous monopoly. A Fianna Fail nurse, a Fianna Fail county councillor, an auctioneer, a public relations spiv, a farmer and a shopkeeper all find themselves running Ireland's roads. They have one thing in common: political connections. As I ended my board search I hit a major disappointment. Up popped a real live practitioner, a man who actually knows a bit about roads. How did he get on the board? Wexford County Manager Eddie Breen, one of the finest public servants it has been my pleasure to encounter, is a director. How a man of such independence and expertise slipped through the political Stalinist test, it is difficult to fathom. But Eddie made it. There should be an inquiry. The NRA needs more directors like Eddie. The board is patently ill-equipped to deal with the current fiasco at the toll bridge. The State monopoly has imposed a system of tags that would test Job's patience, a choice of charges that would challenge Einstein's intelligence, a penal fees structure that makes NTR look like Santa Claus, a work rate that would make Dublin Airport Authority seem dynamic. (It will take eight weeks to dismantle the barriers. Has the NRA never heard of a bulldozer?) And worst of all, the NRA has cooked up a punitive system of enforcement that would embarrass the politburo in old Albania. Who will be the first to go to jail for failing to pay the €3 fee? Another Fairytale Using CBRE Data? Judge Peter Kelly, head of the Commercial Court, gave short shrift to developer Liam Carroll's "fanciful" scheme to turn a €1bn-plus loss into a €300m profit in three years. The survival projections put forth, said Judge Kelly, were devoid of reality. An Independent Accountants Report (IAR) furnished to the court was originally littered with inaccuracies, though later corrected. The IAR, the backbone of any examinership application, was written by an accountant who acted as auditor to Carroll's companies. Prepared in four days, the IAR contained trading projections crafted by the same captains of management that steered the ship onto the rocks. Not only were the projections not independently assessed, but the two valuers -- CBRE and Hooke and McDonald -- who prepared the now seven-month-old valuations, had previously worked for Carroll's companies.